If you research the word pulse you come up with all sorts of variations on the definition; from the throbbing of arteries caused by the heart contracting, to the edible seeds of leguminous plants like peas and beans. But given that this is the electric industry, the definition we’re searching for is “the sudden fluctuation in electrical quantity, as in voltage or current”. But what does that really entail and what does KYZ have to do with it? Sometimes a little refresher on all the variations of measuring electricity is just what the doctor ordered. Given that Solid State Instruments is in the “pulse business” we thought it might be nice to give you a little pick-me-up on the basics of KYZ pulses. When energy use is high the speed of switching from K – Y to K – Z increases, and as energy use declines the switching slows. 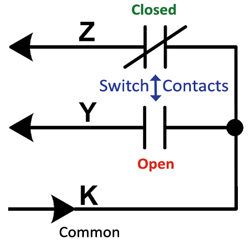 While the speed of switching increases and decreases with power use, the duty cycle (time each switch is closed) is always approximately 50/50; meaning that each side’s on and off times are the same. This provides a universal way to record and transmit energy usage information. 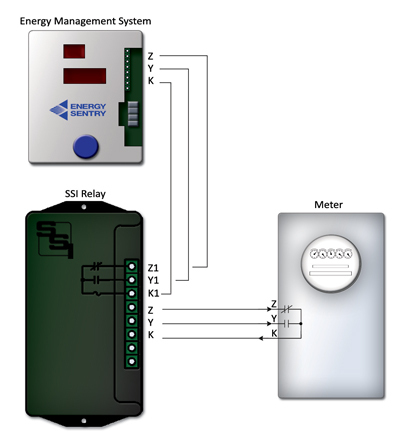 Most SSI devices are used to protect the meter from transient damage like a lightening strike, and/or to provide multiple outputs of information to different downstream (receiving) devices. We also provide totalizing devices that take multiple inputs (such as multiple meter information) and tabulate/ totalize the information for one output. I’m sure by now, all those courses on electricity, meters, and pulses are starting to come back to you. To keep the momentum going, read through the list of Standards and Definitions to clear out any additional confusion on KYZ Pulses. Pulse values are almost always given in kilowatt hours. You can count them for energy or time them for demand. If you count pulses, you are accumulating the total kwh’s of energy you have consumed. If you time them, you can derive the instantaneous demand (KW). Form C is the same as a 3-wire pulse interface. Form A is a 2-wire interface. The standard in the utility industry is Form C. Form C pulses are SPDT, while Form A pulses are SPST. A Form C output can be used as a Form A pulse by using only K and Y, or K and Z, and doubling the Form C pulse value. Form A pulse values are always double Form C pulse values. Example: .024kwh for a 2-wire equivalent of the pulse value in Standard #1. KYZ Pulse initiators are Dry-Contact switches. This means that there is no internally applied voltage from the electric meter. The “wetting voltage” must come from an external source. The convention in KYZ pulse metering is that the downstream piece of equipment supplies the wetting voltage to the upstream device. Form A: a two wire interface using only K and Y.